Back in June (see this post), I reported on how some of my elephant garlic plants were doing really well, while others… weren’t. These had failed to thrive and had succumbed to our garden’s massive snail population before they had a chance to flower. The failed garlics one thing in common: they were the plants where I’d grown mizuna in the pot as a companion crop. I think it would have been OK if I’d taken the mizuna out the moment it started to bolt, but I left it in there and I think it probably sucked all the nutrients out of the compost, thus weakening the garlic plants. Conclusion? Ten inch pots are fine for growing elephant garlic, provided you pull up any companion crops before they have a chance to weaken the garlic. I’ve noticed an interesting thing about our elephant garlic plants. Some of them have grown up tall and strong, with flower buds waiting to burst into bloom, while some of them appear to have failed altogether – their stems are yellowing stumps that have become prey to slugs and snails. The failed ones are those which I companion planted with mizuna last autumn. Maybe I left the mizuna in too long (it had bolted, flowered and gone to seed), so that it was sucking vital nutrients from the garlic? As an experiment, I dug up one of the mizuna-containing pots to see what was underground, so to speak. Answer? an unripe bulb of elephant garlic, which will hopefully have grown and divided in a month or so’s time. I will do more companion planting of this sort next year, but I shall remember to uproot the mizuna before it starts to bolt. 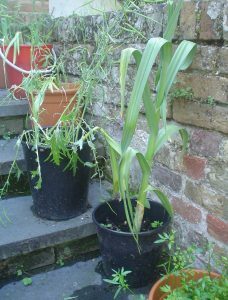 Top tip: I grew mizuna from seed in the same pots as the garlic. So while the garlic was sprouting last autumn, I also had a crop of salad leaves. 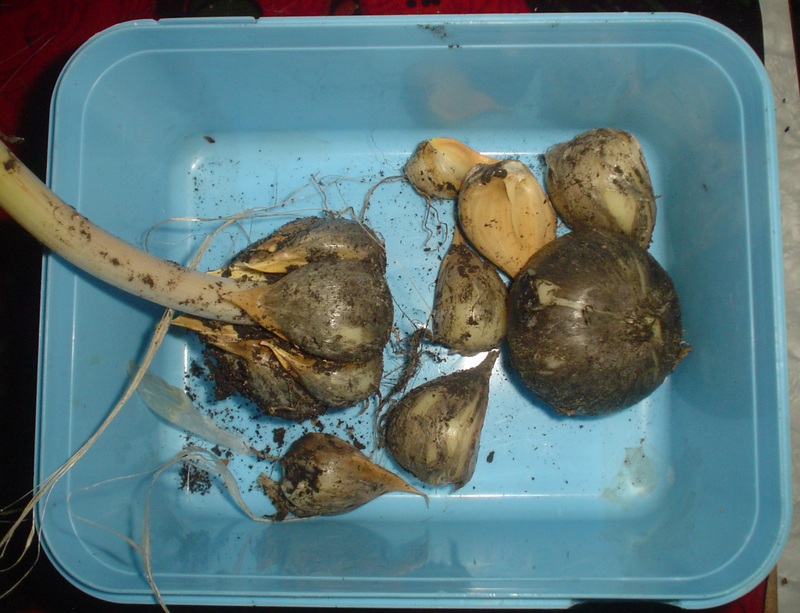 Planted eight normal-sized garlic cloves at the weekend – I looked up in this blog to remind myself when I planted them last year, and FWIW, I am two weeks later with them this year – Nov. 6th as opposed to October 24th. Am in two minds about whether to bother with elephant garlic again. Though the elephant garlic I planted last year tasted fab, it wasn’t, er, elephant sized like I expected. Though according to my other half, that might be because I didn’t leave the garlic in the container for long enough. Apparently according to him, the bulbs keep on growing, even when the stalks/leaves have wilted. At last – elephant garlic! This is a message of hope to anyone else out there who planted garlic cloves (elephant or otherwise) and thought they’d been killed off in the cold weather! All four of my elephant garlic cloves have now sprouted – one of them is shown below. Not only that, but all my cloves of conventional garlic have now done so too. Looking forward to roasted elephant garlic in the summer! 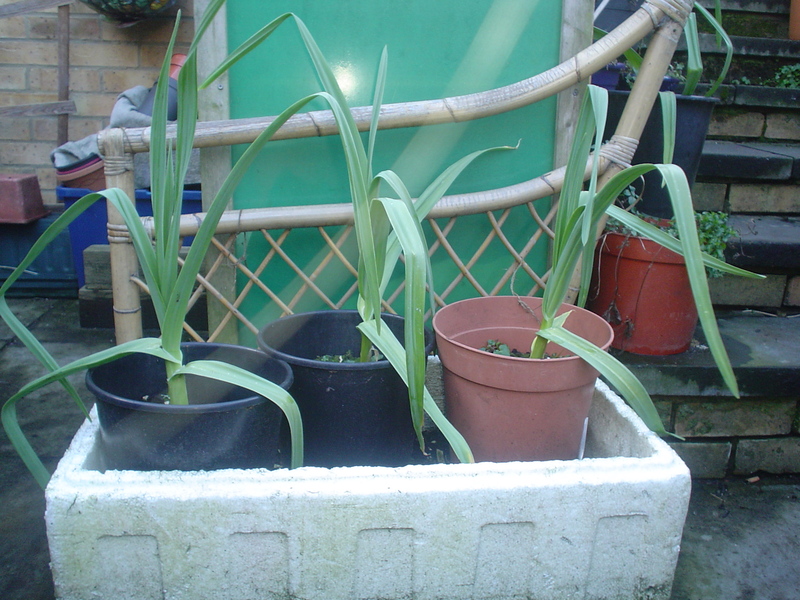 Three of the normal-sized garlic cloves I’ve planted have finally poked their heads above the parapet, so to speak. But no sign of the elephant garlic yet. I have a feeling that it might be something to do with the torrential rain we’ve been having recently, which has turned the compost in my pots to a sort of spongy mess. Will leave all the garlic cloves in situ for a bit and see what happens, although surely there should have been signs of life by now? The four cloves of elephant garlic, ordered from someone with the eBay user ID grahamdn1a (presumably not his real name lol), arrived today. Total cost including postage: £4.80. This might seem a lot but I am hoping that these babies will be the gift that keeps on giving, year after year. 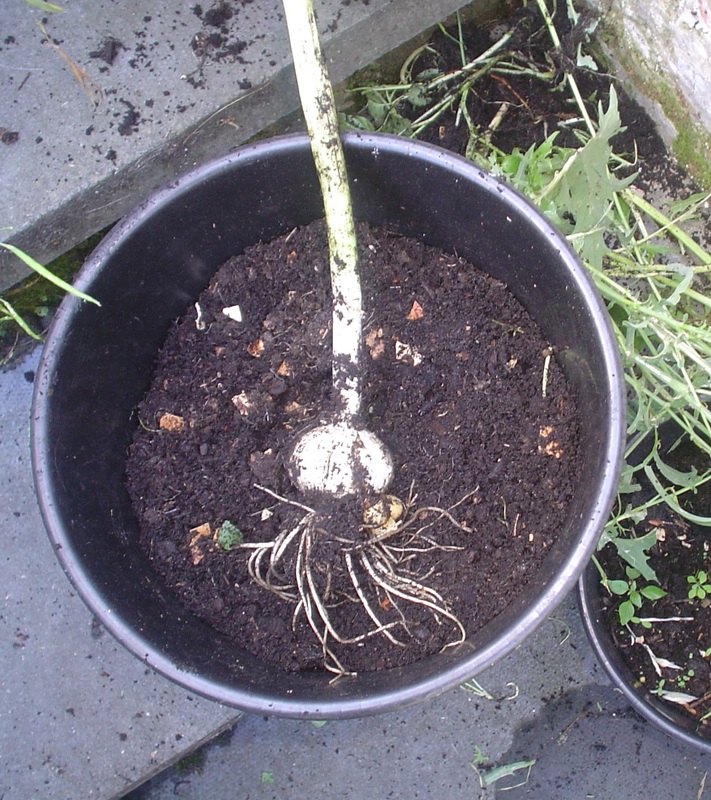 When there’s a break in the rain, I plan on planting them outdoors in similar (but deeper) containers to the ordinary garlic I planted at the weekend – there should be just enough fully rotted home made compost left! There’s nothing much going on gardenwise at the moment, although I was glad I watched Gardener’s World the other night, because there was an item on planting garlic. (If I hadn’t seen the programme, I’d probably have forgotten.) Last year at thsi time, I planted a single trough with half a dozen cloves of ordinary supermarket/greengrocer garlic. This July, we wolfed down our garlic harvest in next to no time – they were lovely and tasty, and I wished that I’d planted some more. So this year I’ve done two troughs (each one of which is about 65 cm long by 12 cm deep). I’ve also ordered four cloves of elephant garlic off eBay. I’ve never had elephant garlic – apparently it’s a bigger, milder version of bog standard garlic. Sounds as though it would taste fab roasted as a vegetable. If you’re wondering what the chicken wire is for, it’s to keep the cats off until the garlic sprouts!